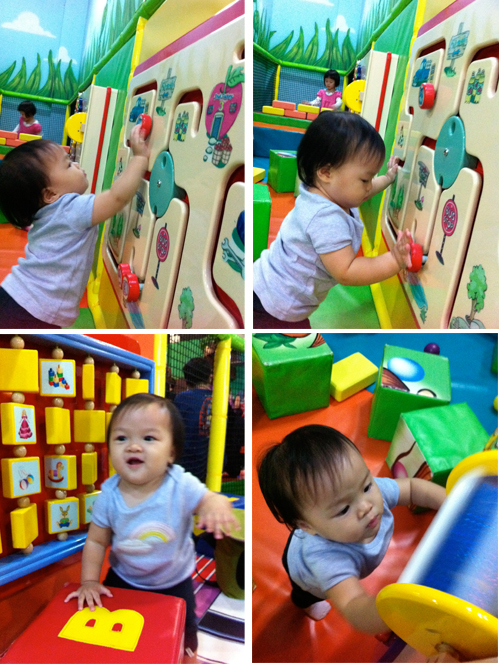 We've been bringing Kaitlin to quite a few indoor playgrounds lately, and one of them's Amazonia Singapore located at Great World City. They have a variety of activities available apart from the usual slides and play areas. For toddlers and those younger, they have a toddler play area which is soft padded and includes a ball pit, a large musical keyboard, mini slide and interactive play panels. Other activities for older kids include Jungle Play Gym, 3D Glow Golf and a Spaceball room. Since Kaitlin is still tiny, we couldn't try out the other activities and played at the toddler area. Kaitlin's favourite was the mini slide. She also spent most of the time there playing with the interactive panels. We went down on a weekend and it was very crowded with alot of kids running around everywhere. We witnessed a few incidents where there were violent kids bullying the others. Thankfully for some, their parents and helpers were around. I think it's best to be with your kids when in such environments, especially if they are under 3. You never know when accidents may happen. Amazonia also has a cafe within it's premises. I like that they have a cafe for parents to chill while their older kids go around doing their own stuff. For us, since safety is an issue, we of course couldn't leave Kaitlin on her own to play, but we liked that we could grab a drink and re-charge from all that playing around. There are also magazines for adults at the cafe, and books for kids! They also hold birthday parties so perhaps we might even look into that in the future for Kaitlin's birthday. Location wise, it is very convenient for us, as it is a few bus stops away. On other days, we even take a stroll over to Great World City. Amazonia Singapore is definitely worth checking out. You can find out more information about them and the rates on their website.